The Benefits of Using Honey to Help Your Acne, From the Inside, Out! There are countless creams, lotions, serums and spot treatments out there to help anyone with acne-prone skin improve their condition, but there’s one natural ingredient that can be effective without worrying about what you’re putting on your body, and it may already be your kitchen. Honey has been used to help with various skin conditions for years, including acne. It is naturally rich in anti-bacterial, anti-inflammatory, and antioxidant properties, and when used in its raw form (which is how all use of honey for skin care is recommended,) delivers a healthy dose of vitamins, enzymes and phytonutrients that can strengthen the skin. Raw honey is mainly used to moisturize and soothe dry, damaged skin, and its osmotic effect on the skin, which draws out excess fluid in a wound or irritation, can provide temporary relief for inflammatory acne, while reducing redness and even scarring. How Can Honey Benefit Acne-Prone Skin? When it comes to honey and acne, understanding how the inflammatory response of the body affects the skin is knowledge worth knowing. Inflammation is a natural, internal response of the immune system in an attempt to protect itself from foreign irritants, such as bacteria, chemicals, or even foods that one’s body may be inclined to reject. In terms of acne, inflammation can occur when a pore becomes clogged with too much sebum, or oil, and dead skin cells, which combine to form a bacteria called P. acnes. This response can result in red, swollen bumps on your face (pimples) that are often painful and irritating. In order to treat acne, the amount of sebum being produced must be managed, but one way to combat an over-stimulated inflammatory response is to consider the foods that we put into our bodies, and the hygienic practices that affect the surface of our skin. Raw honey can be used to help with this process both internally and externally, through diet or DIY skincare remedies. 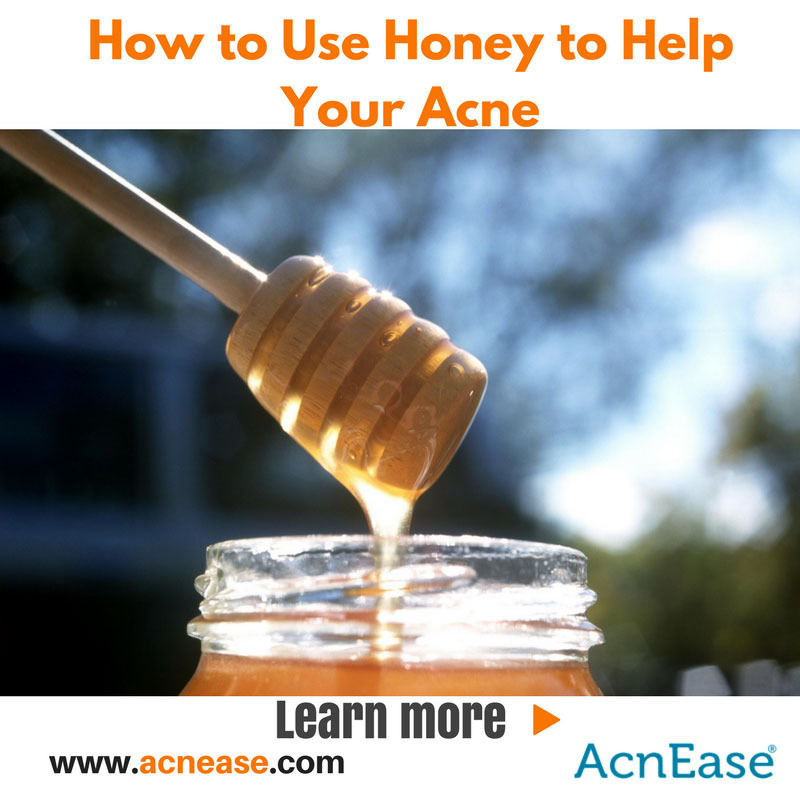 What are Some Ways to Use Honey to Help Alleviate Acne? Internally- If you’re looking to experience the natural benefits of honey, the best place to start is from within, by adding the sticky treat to your diet. You can take advantage of its anti-inflammatory and antibacterial properties by simply adding one part raw honey to two parts lemon juice for a quick drink that will help boost the metabolism and detox the body. To add some honey to lunch or dinner dishes, check out these fall-themed acne-friendly recipes that call for the sweet stuff in place of sugar for a healthy option. Like acne or anything else, not all honey is created equal, so you’ll want to take care to reach for raw varieties over the processed stuff you’ll find in that cute, plastic bear. Manuka honey is one type of raw honey that is loaded with health benefits, including amino acids, as well as vitamins and minerals such as manganese and zinc, both of which are known to improve acne-prone skin. Externally - You can also get a lot out of raw honey by putting it directly onto affected areas of the skin, and there is certainly no shortage of DIY recipes out here to choose from, depending on what you hope to achieve. Honey is most often used as a hydrating cleanser or moisturizing mask, but can also work to speed the healing process on broken skin, which can reduce scarring while brightening and lifting existing scars and marks. To create your own exfoliating mask, simply mix equal parts honey and brown sugar into a paste, gently apply to the affected area, and rinse away with warm water after about 10-15 minutes. While honey and other natural ingredients can make your skincare journey toward an acne-free complexion a little easier, the only way to truly treat and prevent acne is to treat the problem at its source - the sebaceous glands. AcnEase® works from within the body to help prevent the sebaceous glands from overproducing sebum, an oily substance that can clog pores in excessive amounts. Using all-natural, herbal ingredients, AcnEase® is gentle on the skin and body, and is safe for use among people of all ages, no matter how severe their acne symptoms, with no side effects! When combined with a topical face wash and a DIY raw honey treatment, AcnEase® will be your skin’s best bet remaining acne-free! We want to hear from you! Do you use raw or manuka honey to help soothe your acne symptoms? Have any favorite recipes to share with our readers? Tell us in the comments!